Now there's a president we don't hear about except for his death. Sounds like an interesting read. Your presidents certainly provide interesting blog topics but thank goodness there are authors who will keep history alive. Sounds like an interesting read about a little known man. I didn't know he lived so long after the shot. Somehow that president got skipped over in my history classes. Other than being assinated, I know nothing about Garfield. So sad that history of our nation is only told by what is popular. JFK aand modern presidents are written about in hundreds of books and thousands of articles. 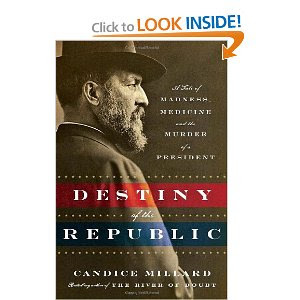 Movies are also made to keep many myths alive. .
Glad to know a more obscure president has a good biography like this. He wasn't the only one to be killed by his doctors...as I remember, Washington was bled to death by physicians.